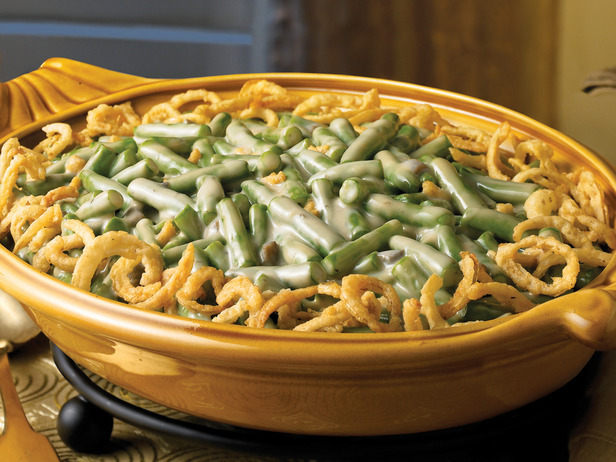 As families gather for their holiday feasts across the country, millions of Americans will look forward in particular to one enduring favorite side dish: the green bean casserole. It’s a staple, after all. But it wasn’t always so. In fact, it was invented by a Campbell’s employee, one Dorcas Reilly, some 60 years ago. Hard to believe, but canned soup, fried onion bits and green beans weren’t always a natural go-to combo. Now the dish sells millions of dollars in condensed mushroom goo every fourth quarter. It’s in the spirit of Campbell’s immortal La Reilly, then, that we aren’t sure whether to chuckle, cringe or take a bite when we see things like these seven flavor experiments. Some are new, some are just new to us, and some are sure to be gone by the holiday season next year. 1. 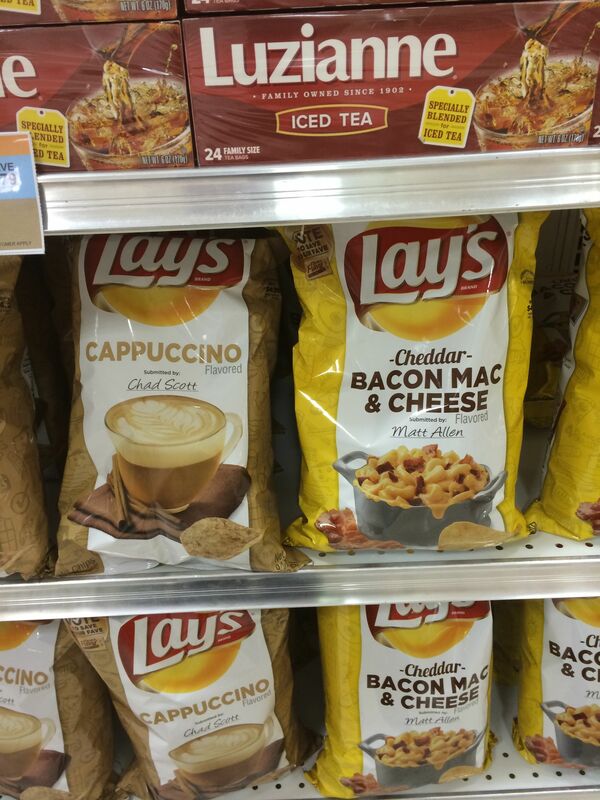 Cappuccino Potato Chips, from Lay’s, which also test-marketed Cheddar Bacon Mac & Cheese, Mango Salsa and Wasabi Ginger this year. 2. 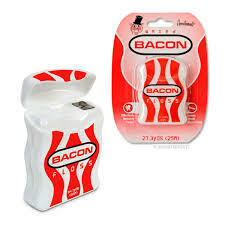 Bacon dental floss. Jill also notes the growing popularity of bacon-flavored additives, including this one. 3. 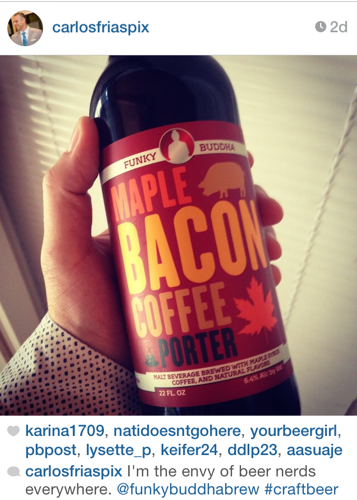 Carlos Frias of The Palm Beach Post posted this on Instagram: Maple Bacon Coffee Porter. From Funky Buddha, no less. 4. “Garlic ice cream is the latest craziness I’ve heard about,” says Meridith Ford, a pastry chef, former dining critic at The Atlanta Journal-Constitution and currently a marketing consultant for Atlanta restaurants. Crazy — or inspired? I think this one could work. I still dream of Hector Santiago’s avocado ice cream at his late Pura Vida. And I don’t even mind Richard Blais’s foie gras milkshake, which endures currently at his Flip Burger chain. 5. 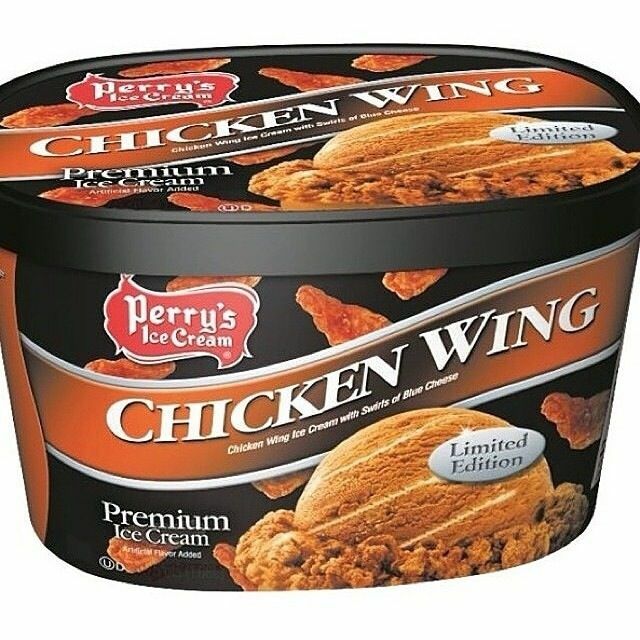 Chicken Wing Ice Cream. Here, though, we draw the line. “They are a Mississippi Delta classic started years ago by kids in poor neighborhoods who would go into convenience stores after school and buy a pack of Kool-Aid, open it up and sprinkle it over a jumbo dill pickle,” Susan says. “Then store owners saw an opportunity and started marinating them in different flavors. They are not for everyone, to say the least. 7. 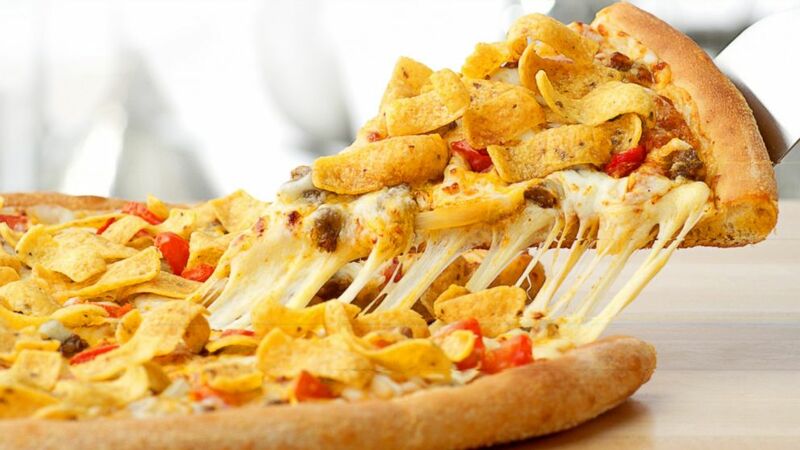 Frito’s Pizza at Papa John’s. Susan’s husband, Ralph Ellis of CNN, points out this one but offers no elaboration. So, will any of these make it to your kitchen this year? Send us your own crazy favorites. This entry was posted in Atlanta, Business Comms, Entertainment, Social Media and tagged dining, Facebook, Food, holidays, instagram, marketing, Social Media on November 14, 2014 by Jay Croft. I used to be a journalist. Hard-news reporter, then a website and features editor. At daily newspapers, for a long time. Later, in corporate communications, I learned how to create and share information in a corporate setting. Today, communicators in businesses, social media, public relations and marketing like to talk about content, storytelling and brand journalism. Which is great — because I love it all and it makes complete sense within broader technological and economic changes in our line of work — and it makes my dual background ideally useful in today’s communications world. But terms get tossed around so loosely that I’m not always sure everyone’s using the same definitions. Here are a few examples I’ve found recently that state things well. I’ve edited for brevity, redundancies and clarity. Content includes words, images, video, and physical stuff. Content is everywhere. In law firms, it’s in boxes. In architectural firms, it’s made from balsa wood or CAD drawings. At my firm, it’s often in people’s heads. There’s no difference between a website and content. Why do you have a web site? What’s it for? Or that mobile site? Or that app? Content is singular in its purpose: to achieve a desired result for as many relevant people as possible. The list of possibilities for content you can use in content marketing is literally endless. As the success of content marketing strongly depends on the content you provide, use your imagination. Your content should stand out from the masses, provide something new and unique. Interview someone who can give your readers, and possible customers, some insight – use the questions to direct the content into your chosen direction and show with intelligent questions your knowledge on the topic. All the stakeholders of an organization—customers, employees, investors, partners, vendors, and yes, even competitors—are telling some aspect of the story of the brand. The issue? They’re not always talking about the same thing. How do you get everyone on the same page? The corporate narrative provides the framework. It is a story that embodies the essence of your business in action, comprised of more than just products and services, and more even than your mission statement. It’s what your company stands for, and how it’s making the world a better place. It’s a story that comprises your strengths AND your weaknesses. Some businesses think storytelling is about explaining what you sell or telling people what you do. But effective storytelling explains what you do for your customers. The power of stories lies in making the reader and the consumer part of the story. If we think and act like a publisher, we will create more of the content our customers are looking for. And LESS of the content they ignore. One of the biggest challenges in content marketing is to put the needs of our customers ahead of our own and to tell stories that connect with people. Identify your potential customers’ top questions. At a minimum, your content should be helpful. Ideally, try to even entertain them. What role does content strategy play in content marketing and brand storytelling? How much content strategy does a brand need? And, oh, by the way, what is content strategy? You could also make the very valid argument that brands have always used journalism-like tactics to promote their own stuff. Marketers invented the advertorial and infotainment, after all. In those cases, that’s not really journalism so much as paid media. That’s not what brand journalism appears to be, however. We’re seeing brands trying to become the media, and attempt to be true, actual media sources. This is partly what differentiates brand journalism from standard content marketing and inbound marketing – brands are seeking in some cases to become media sources that consumers would choose to consume independently, even if it’s not directly related to the brand’s product offerings. That makes brand journalism a true force to be reckoned with. 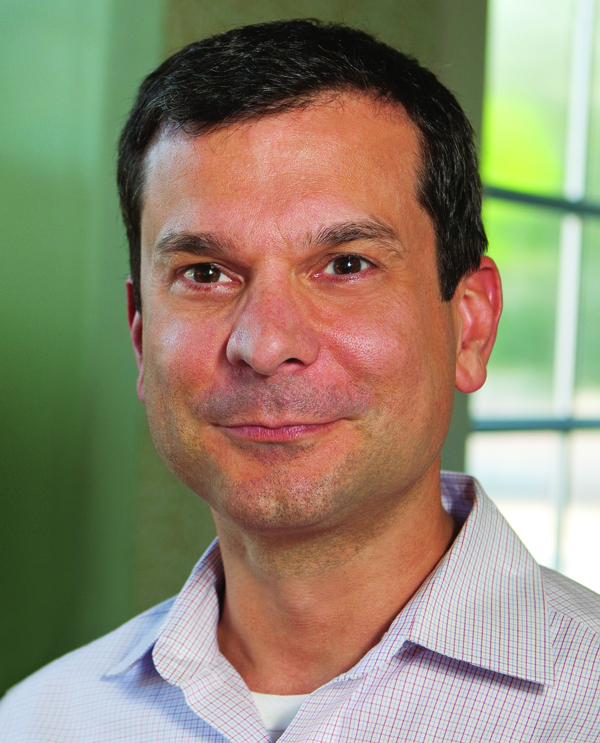 This entry was posted in Atlanta, Business Comms, Social Media and tagged brand journalism, coca-cola, Communications, content, corporate communications, marketing, reporter, Social Media, storytelling, writing on February 13, 2014 by Jay Croft. 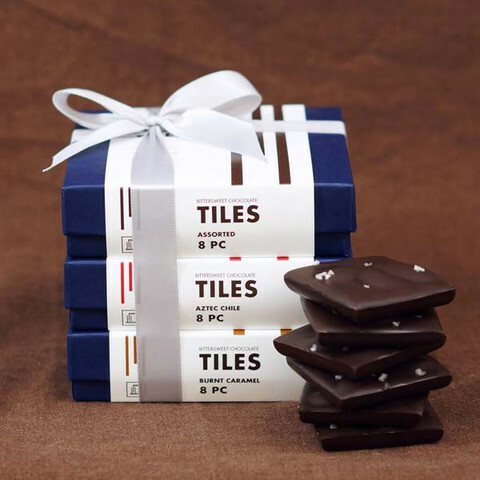 The story of Kathy Wiley’s chocolate company, San Francisco-based Poco Dolce, just got even sweeter. After the 49ers’ loss Sunday in the NFC Championship Game, San Francisco’s mayor is sending Poco Dolce treats to his Seattle counterpart, part of a charitable bet the two made before the Seahawks won a ticket to the Super Bowl. Wiley chose the name because “poco dolce” means “not too sweet” in Italian. She started the company in 2003 and now has 10 full-time employees. Mayor Ed Lee and some of his staff members are set for a tour of her 6,000-square-foot production kitchen next week. RELATED: Jeni’s Ice Cream opens in Atlanta, plans another location. RELATED: Richard Blais brings Flip Burger to the neighborhood; everybody wins in Burger Wars. This entry was posted in Business Comms, Social Media and tagged chocolate, marketing, NFL, san francisco on January 20, 2014 by Jay Croft. “Storytelling” and “content” are buzzwords in business communications, with a lot of articles and studies flooding the blogosphere. Some of it seems obvious (people are more engaged by stories, information with emotional content and resonance, rather than by mere facts or reasoning). Some of it seems a bit mushy – “content” might mean one thing to a marketer, another to someone in employee comms and several other things to people who produce or manage it. Just today, my Twitter feed brought up two articles making a connection between storytelling and brain function. As presenters we want people to pay attention, be engaged and remember the message. The key to doing that? Science now says it involves storytelling: Stories stimulate emotions, which may be the key to better learning, attention, memory and decision making. That’s from an article headlined The Science Behind Storytelling — and Why It Matters on slideshare. A Forbes article touts the cognitive benefits of reading long-form narrative, like novels. And this headline/subhead combination from the WSJ brought it home: To Persuade People, Tell Them a Story; Narrative Is a Powerful Way to Get a Message Across. Finally, Search Engine Journal offers this intriguing post: Leading Experts Predict The Content Marketing Trends for 2014. We all want to persuade audiences, and storytelling and content will continue to be more important in business in 2014. Effective storytelling needs good storytellers, who know what a good story is (and isn’t), who can gather information, break it down and present it again in ways that matter to selected audiences. To have a good story, you need good content, yes — but you also have to know how to present it, to whom and why. Fun stuff to think about and to tackle in our work, whatever kind of stories we tell. This entry was posted in Business Comms, Social Media and tagged Blogs, content, corporate communications, marketing, storytelling on December 29, 2013 by Jay Croft.